Real Riders: 2016 LML Star Auto Review, Back To The Future! The 2016 LML Star Auto makes no pretence about where its origins lay – the Vespa PX scooter – there’s no denying the resemblance. But that’s where it ends; gone is the PX’s classic two-stroke ‘pop-pop’ exhaust sound, which is replaced by the deeper thud of a modern 125cc four-stroke automatic engine. Nostalgic memories come flooding back! 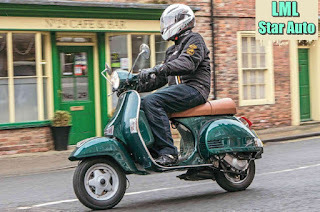 There’s no mistaking the retro Italian styling of this scooter, which provokes a host of nostalgic memories to those of a certain age – well that’s me then! But if you think it looks a bit plain, then tailor it to suit your personal tastes, due to the wide range of styling option that are available including stickers, decals, seats and custom designed themes. There’s something to everyone. You didn’t get very much back in the 1970s – and things haven’t changed a lot in that respect. The instrument dial is a basic design with the obligatory warning lights, a fuel gauge and not much else. Don’t go expecting the underseat storage space you’ll find on a modern auto scooter either – there isn’t any. You do get a reasonably sized front legshield storage box though and you can fit a reasonable amount of stuff inside it, as I found out while using the scooter on a local charity bike ride. The 2016 LML Star Auto riding style is a little different from the norm; the handlebars are fairly low in relation to the seating position, which means that the rider tends to be leaning forward slightly. But once you’re used to riding like this, it isn’t a problem. The modern four-stroke auto engine accelerates smoothly from standstill and bowls along happily at an indicated 55mph with no issues; push it hard and it will take you up to an indicated 60-62mph at a push. From a comfort perspective, I have to give LML full marks, as the seat is by far the best of any retro-styled scooter I’ve ever tested – well done on that point. 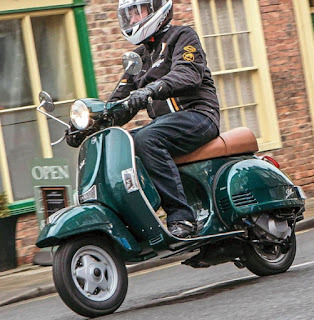 As to the handling – well, all I can say is that the scooter certainly replicates its 1970s heritage to a tee, aided and abetted by its Vespa-style single-sided suspension and the small 10in wheels. The unique selling point of this LML Star Auto is its retro styling and a perceived heritage of a time gone by – and that will help it to sell well to those wanting to relive their youth, or even to those who want to join-in with the current scooter revival trends at a reasonable cost (have you seen the price of a traditional classic Vespa)? And for that reason it should sell well.